This entry was posted in 2012 and tagged 2012, victoria. Bookmark the permalink. 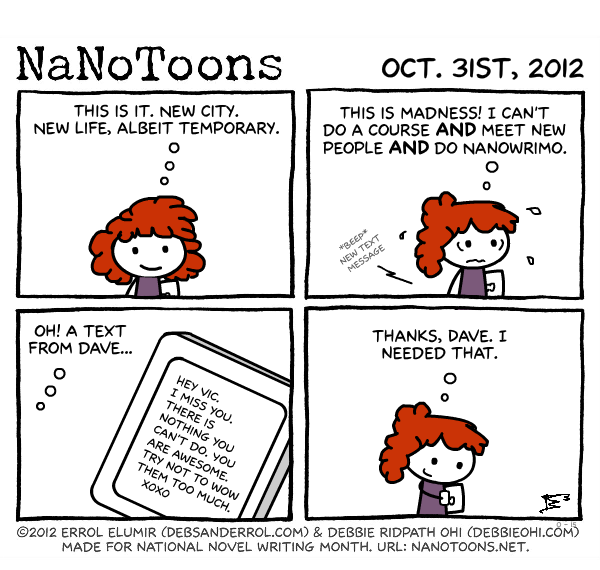 Congrats on doing your first NaNo!! You guys are amazing! Truly! I can’t wait to see the rest of the NaNoMusical episodes, too! That was a great musical! I’m excited (terrified, really)to be a part of this again. Now if only I could think of something to write about! Good luck with your NaNonovel, Andy! Don’t be scared, Gena. 🙂 It’s going to be SO FUN. I love the musical! Rick has so much energy! He does! 😀 He’s super excited about Nano. 😀 As are we! I’m really glad you like the musical! Great job guts. Oops. Guys. I mean guys. Really.